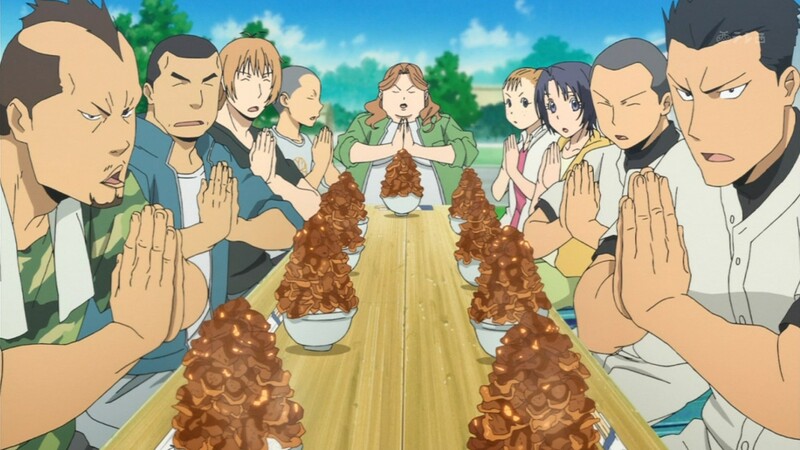 Silver Spoon, Dona Dona, Farewell, Buta-don! Ahhh, so sad. 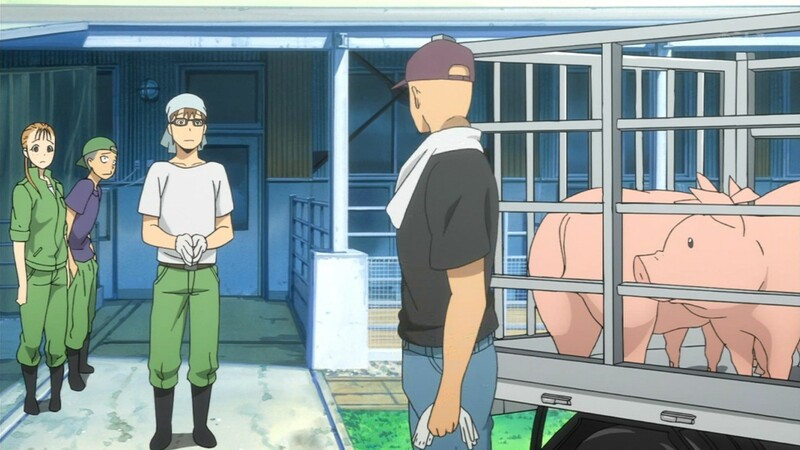 Hachiken’s pet, Buta-Don, a pig that he raised, was sold. 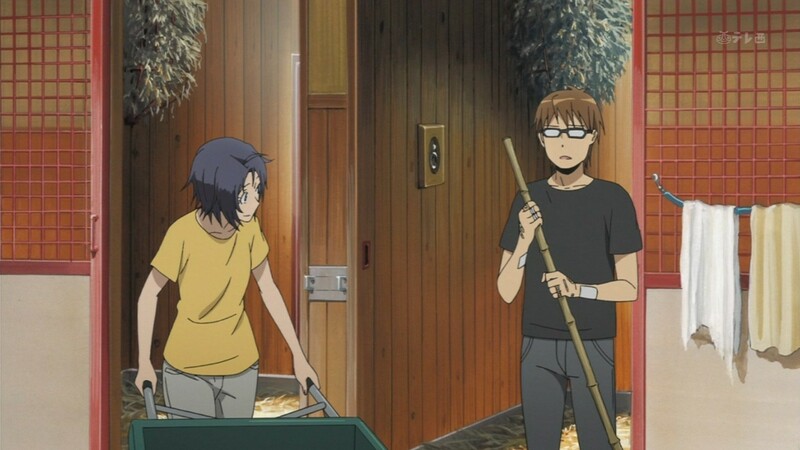 Dona Dona, sang by Joan Baez, but now the concept of this song turns into Silver Spoon Episode 10. Yes, NHK choir had Dona Dona. Ko-ushi wo nosete~ (carry a calf). Well, but “kobuta wo nosete~” A wagon carrying a piglet to the market. Yes, the market is of course the capitalist temple. Ship out stocks from animal farms, yes, particularly a pig farm, sold at the market, and then goes to slaughterhouses. Jesus should drive out of merchants from the temple and rescue pigs before going to slaughterhouses. But he is not kind to pigs, since Judeo-Christian-Islamic cultures, or so called the Abrahamic culture despise pigs as filthy. So, as a moe pig, as a dirty pig, only moe girls can save me. And, this eco system, yes, food chain, pigs get fed with whey, and moe pigs get fed with moe, which is whey to us. Yes, manna. Yeah, stocks were animals in the time of Jesus. What Hachiken did was stockbreeding. But now, stocks are traded in Dow Jones. Yes, Jesus killed pigs, which were stocks that could be sold, so the breeders drove Jesus out from their farm place. So sad, food chain, horrible. The whole eco system is food chain built on killing of lives, it’s not something that environmentalists idealize. Even vegetarians kill plants, though proxy killing. That was a tough episode. And yes, they show the slaughter scene to the agricultural students, which reminds me of Paul McCartney’s Glass Walls. Yes, Beatles were heavily influenced by Indians, and the most prominent way of life that Indians follow is ahimsa, it was promoted by Mahatma Gandhi for non-violence resistance. Yes, ahimsa, non-killing, this doesn’t limit to humans but all sentient beings. Yes, all animals, even flies and roaches, not only humans and animals, but all six realms of samsara (3D world), and the 4th realm is tiryagyoni (animal realm). Yes, where we moe pigs belong! Yes, in Spirited Away, Chihiro’s parents turn into pigs, but I don’t know why? Did they ever watch moe anime? Is that Miyazaki’s statement to us that we should avoid watching moe anime? I don’t think so…So it doesn’t make sense. That whole movie doesn’t make any sense, surely Miyazaki already passed his moment when made that film. His best time was of course Naussica and Laputa. So, Hachiken decides to buy Buta-don’s meat. 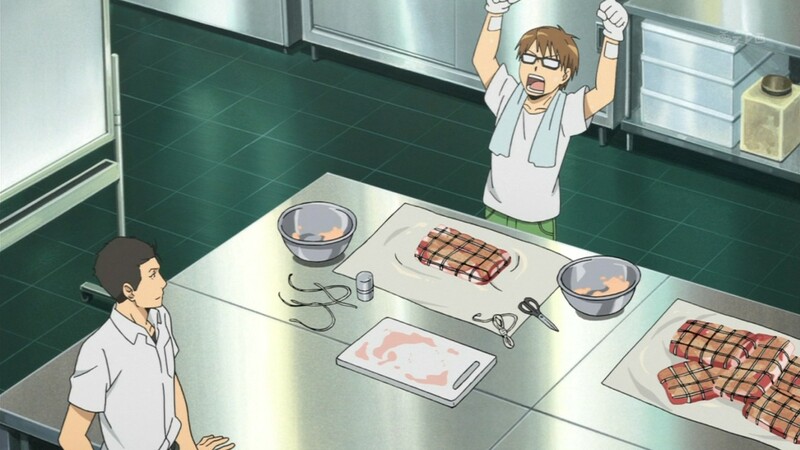 He wasn’t going to rescue Buta-don from going to a slaughterhouse, but he buys Buta-Don’s meat after “process.” And then, he seasons the pork by himself. And after that, he shares the pork with his schoolmates, yes, buta-don (pig bowl), including a cute equestrian girl, Mikage. I wish I could be her horse, yes, that derriere bouncing, which Clark Gable also fancied about Marilyn Monroe’s horse-riding in the movie Misfits! 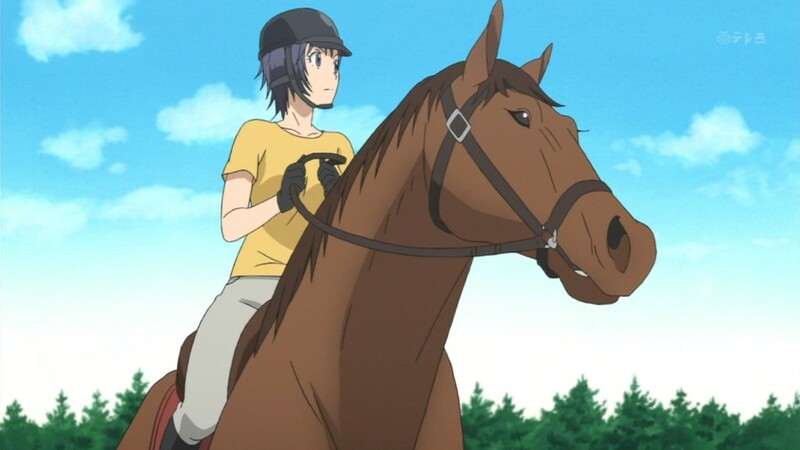 I want to be her horse! Hihiin! Yes, a pet you raised, you wanted it to be within your eco system. And the final consumer is you, while you’re a producer. Yes, this is like potlatch. Traditionally in Hokkaido, the Ainu people killed higuma bears and shared the meat with everyone in the clan. Yes, this reminds me of Abraham going to kill Isaac or Ishmael, whichever, but instead killed the lamb and shared with your community, exactly Eucharist. Buta-don gives lives to students by death, very Eucharist. So yes, living is killing. Christians kill Jesus to live, just like Hachiman killed Buta-don to live. You die, and your corpse, ants and flies and crows and vultures will eat it up. But from dead seeds, gives new lives. That is samsara. So, this episode was very religious. Everyone shares Buta-don. They pray to Buta-Don for dying for them. The Fist of North Star joke was a good one. The bandits with punk rock outfits and mohawks, they mug Hachiken for meat. Not for money but meat. Yes, meat. I bet the author who also wrote Full Metal Alchemist was heavily influenced by Fist of The North Star. That’s why she makes a parody out of Fist of North Star. How come nothing is happening between two of them?